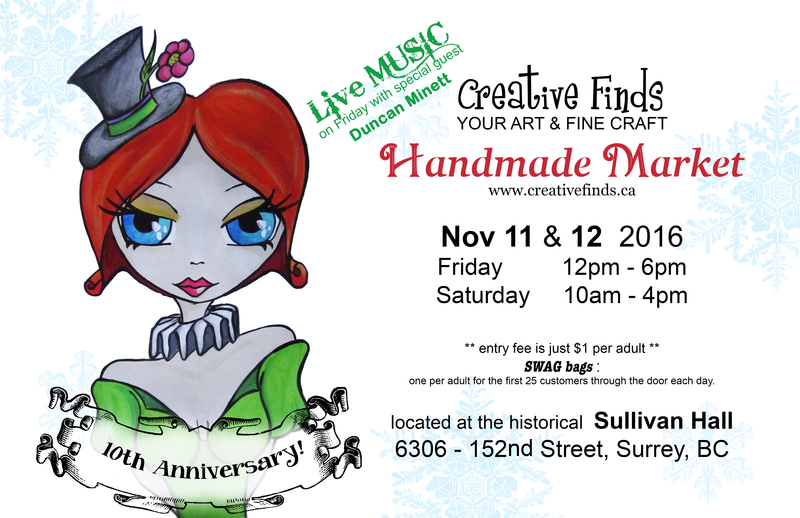 the 10 year anniversary celebration of Creative Finds begins! LIVE MUSIC on Friday by the very talented Duncan Minett! 250 mini celebratory cupcakes from Frosting Cupcakery each day!!! $1 entry gets your name in the door prize & a mini cupcake (while cupcakes last). Lovely hot TIM HORTON’s coffee free to the first 300 adult clientele. Festive flower PHOTO WALL by Blooms & Paper to capture your fashionable poses and/or ‘fabulous’ holiday sweaters on Friday! NOTE: We will be uploading our new funny promotional videos onto our Youtube channel early in the week. Have a fabulous week & we look forward to greeting you on Nov 11 & 12! Next PostNext 2016 Creative Finds video promotion #1!